An invoice is a type of commercial document issued by the seller of goods, addressed to the buyer of goods, giving a description of the goods, the price and delivery terms etc. 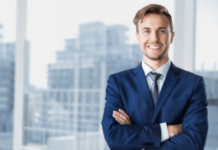 According to letter of credit rules, the description of the goods shown on the commercial invoice is to correspond with the description stated in the letter of credit. According to the letter of credit rules and international standard banking practices, the description of the goods, services or performance shown on the commercial invoice is to correspond with the description stated in the letter of credit. Commercial invoice, which is the only document as defined in the UCP 600, that must show the full description of goods as quoted in field 45-A Description of Goods and or Services. 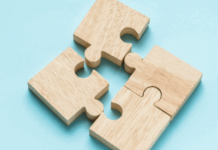 On other documents, the description of the goods, services or performance, if stated, may be in general terms not conflicting with their description in the credit. If the commercial invoice states a description of goods and services not indicated in the letter of credit, banks raise a discrepancy which is known as description of goods on the commercial invoice is not as per L/C terms. Field 45A: Description of Goods and or Services: Evening dress as per proforma invoice dtd 19.05.2014 for goods delivered CIF Stockholm Port, Sweden Incoterms 2010. Field 46A: Documents Required: Signed commercial invoices in one original and three copies, certified by the chamber of commerce in the exporting country and bearing this clause: ”We certify that invoices are in all respects correct and true both with regard to the price and description of goods referred to therein and as per Proforma Invoice no.010 dated 09/05/2014 indicated in this credit and that the country of origin or manufacturer of the goods is Spain” and must be made out in the name of l/c applicant indicated in field 50. The beneficiary presented a commercial invoice, which is indicated an inconsistent description of goods with the letter of credit. Discrepancy: Description of goods not per L/C terms on the commercial invoice. 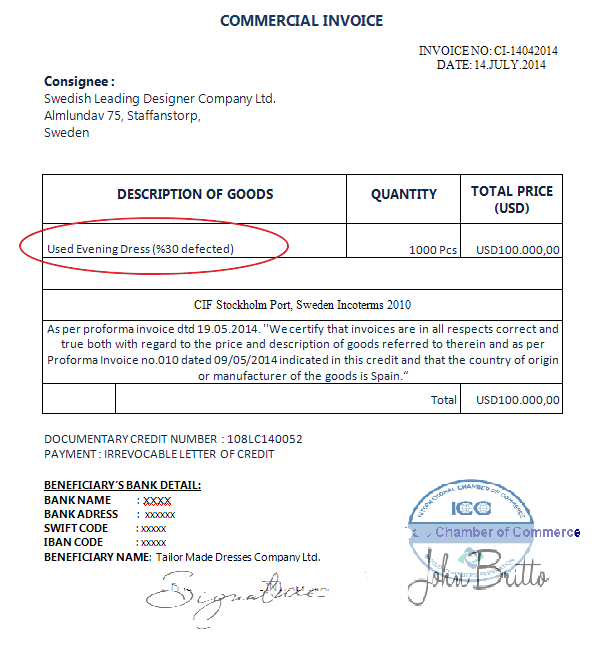 As per letter of credit terms, the commercial invoice should have shown “Evening dress” as a description of goods. But the invoice shows “Used Evening Dress (30% Defected)” under Description of Goods column. 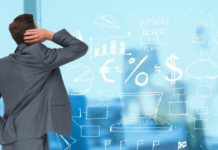 Reason for Discrepancy: The description of the goods, services or performance shown on the invoice is to correspond with the description shown in the letter of credit.